Create flash banners for your website. 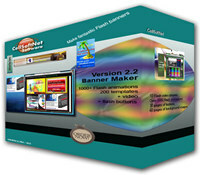 Program has all that is required to make a great banner or even a fullscreen webpage 1260 x 768. No complex programming required, just drag the objects into place either from within the program or import them. To help get you started 200 fully functional templates are built into the program. You can modify the templates in what ever way you choose including adding your own photos, over 1200+ animations (the list is growing), text, music, etc. When you have completed designing your banner or webpage click on the 'create' button to build all the files and add them to a folder of your choice. 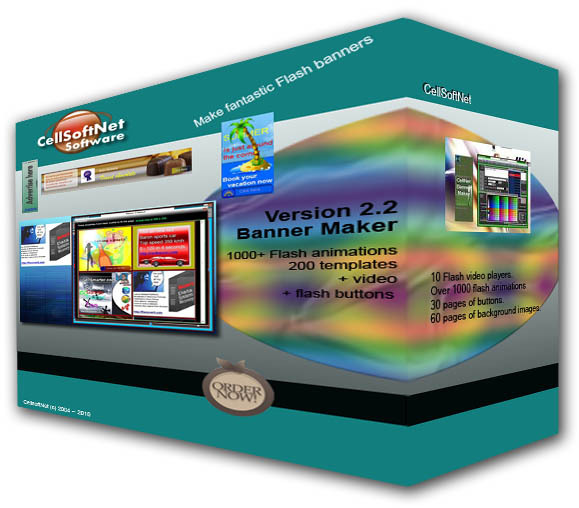 CellSoftNet Banner Maker is a web development program that works under windows xp, windows vista and windows 7. It supports both 32-bit & 64-bit windows editions, therefore it could run faster on 64-bit computers. Estimated download time for CellSoftNet Banner Maker on a common adsl connection is Two minutes. Version 2.2 was released three thousand nine hundred sixty three days ago by CellSoftNet. Click the green download button to download it now.